The Know It Alls Show – The Educational VARIETY Show that will turn you into a KNOW-IT-ALL ! 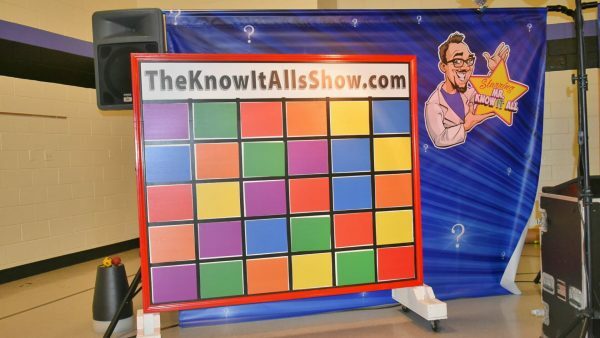 The Know It Alls Show came about from Scott and Patti’s love for entertaining kids and their admiration of the old-time variety shows! Who didn’t love the “I Love Lucy Show”, or “The Carol Burnett Show”! These were classic comedy-variety shows and the Know-it-alls will bring this flair to their own show! Each 45 minute show will incorporate a fun, team building approach with a strong educational format, easy learning environment, and plenty of audience participation. So, let’s break it down into groups and explain how this versatile show will work for you! Each show is approximately 45 minutes long. We typically require 30 feet across and 15 feet deep. An aisle down the middle of the audience will help get volunteers up to our stage easier! What do we need to provide the Know-It-Alls once you arrive? The ‘Know-It-Alls bring everything they need in order to provide a quality, entertaining show. All that is required is a standard 20 amp electrical outlet. How much time is required for set up and take down? The Know-It-Alls will arrive about 45 minutes before show time to set up. Take down is only about 20 minutes. There are many entertaining shows to pick from…why should we choose yours? Great question! 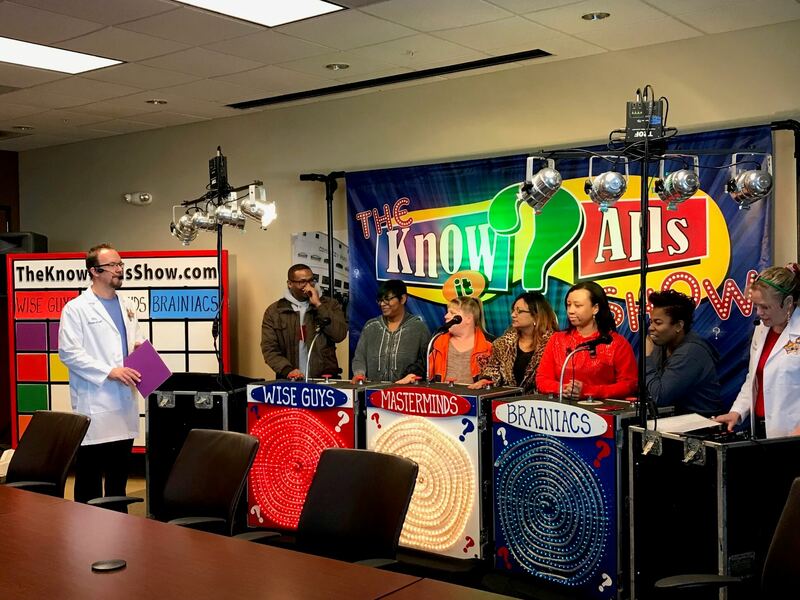 The Know It Alls Show offers the best of BOTH worlds combining Education and Entertainment! Plus learning in a fun environment increases a child’s chance of retaining and using that knowledge going forward! 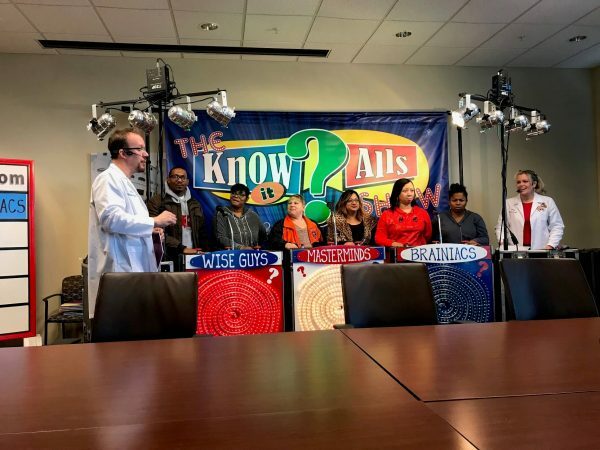 What is the true definition of a “know-it-all”? Well you’re asking the right people that’s for sure! 1) a person who acts as though he or she knows everything. 2) a person who behaves as if they know everything. 3) to be extremely knowledgeable or experienced. What is Mr. and Mrs. Know-it-all’s favorite candy? This is easy! SMARTIES of course! The Know It Alls Show came about from Scott and Patti’s love for entertaining kids and their admiration of the old-time variety shows! Who didn’t love the “I Love Lucy Show”, or the Carol Burnett Show! These were classic comedy-variety shows and the Know-it-alls will bring this flair to their own show! So, letís break it down into groups and explain how this show will work for you! This style show is focused on Common Core enrichment. The audience is entertained by watching the dialogue between the Know-it-alls, while learning the valuable lessons being taught!† Now you should know that the Know-it-alls do not teach anything in a boring way! They use humor, physical comedy, props, etc. to convey their message so the kids retain everything that’s said! 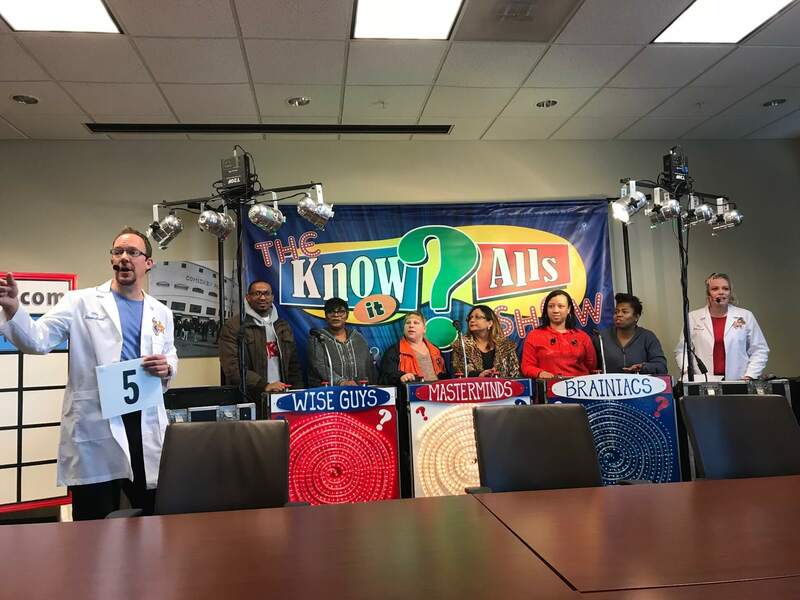 Once Mr. & Mrs. Know-it-all think they’ve done a great job ‘teaching’ the new lessons to the kids, they will bring up volunteers based on their grade level.† They will divide them into three different groups to demonstrate just how much they’ve learned in a quiz-type format. Blocks will be chosen from the ..Wall of Commotion’ by several different volunteers. Each block will correspond to a specific category. Categories might include Math, Science, Social Studies, Language Arts, PBIS, Social skills, etc. This information may be something they already know, have learned in their classroom or have just learned during our show! But be aware! Volunteers must also be prepared for a challenge! Several blocks will require the groups or that individual to take part in a physical challenge in order to win that block! Questions will be given to the groups based on the category that was chosen. The first group to correctly respond will be awarded that block. 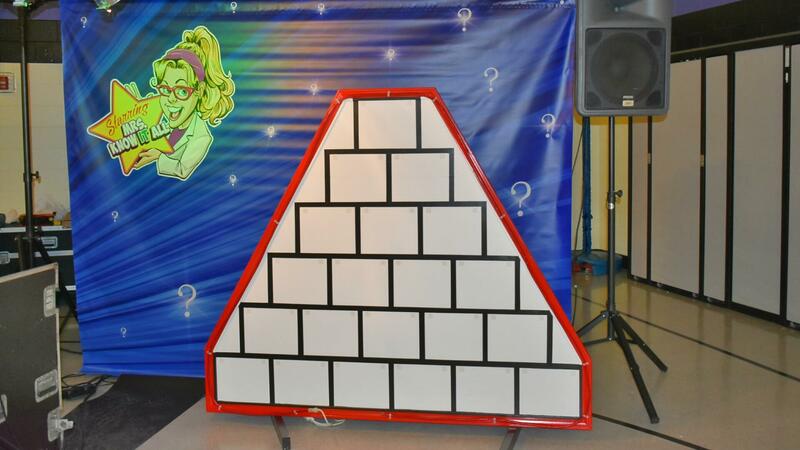 The blocks will then get placed onto the ëPyramid of Knowledgeí. Since this is a group effort, we do not focus on individual teams. All of the groups are working together as ONE team! Every block that is awarded will be used in the construction of the ..Pyramid of Knowledge’! Once the last block is placed on the top of the pyramid, lights, bells and whistles will go off letting everyone know that they just won the Know-it-alls ..CERTIFICATE OF ACHIEVEMENT’ for their entire school! Mr. & Mrs. Know-it-all will proudly announce that everyone has worked together and showed tremendous skill and knowledge by presenting this Certificate of Achievement to be displayed for all to see! CONGRATULATIONS!† You are all now official ‘KNOW IT ALLS’ !!! This style show is focused on Challenging Competitions. The audience is entertained by watching the dialogue between the Know-it-alls, while learning the valuable lessons being taught! Now you should know that the Know-it-alls do not teach anything in a boring way! They use humor, physical comedy, props, etc. to convey their message so the kids retain everything that’s said! Once Mr. & Mrs. Know-it-all think they’ve done a great job ‘teaching’ the new lessons to the kids, they will bring up volunteers based on their grade level. 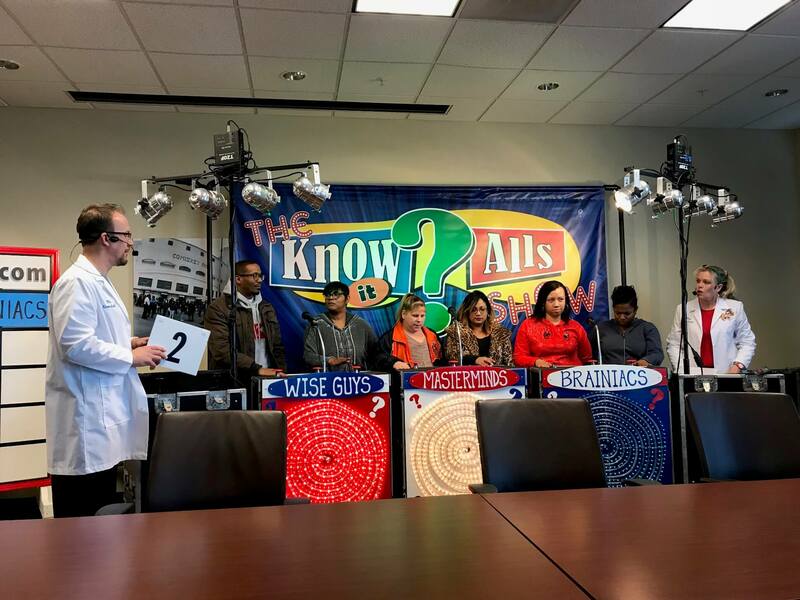 They will divide them into three teams to demonstrate just how much they’ve learned in a quiz-type format. Several competitions will take place during this 45-minute show. Blocks will be chosen from the ..Pyramid of Knowledge’ by several different volunteers. Each block will correspond to a specific category. Categories might include Math, Science, Social Studies, Language Arts, PBIS, Social skills, etc. This information may be something they already know, have learned in their classroom or have just learned during our show! But be aware! Volunteers must also be prepared for a challenge! Several blocks will require the teams or that individual to take part in a physical challenge in order to win that block! Questions will be given to the groups based on the category that was chosen. The first group to correctly respond will be awarded that block. The blocks will then get placed onto the ..Wall of Commotion’! The team with the most amount of blocks on the wall, wins! 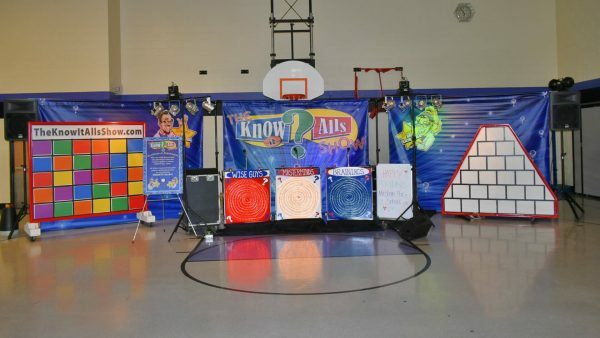 Lights, bells and whistles will go off letting everyone know that they just won the Know-it-alls ..CERTIFICATE OF ACHIEVEMENT’ for their entire school or camp! Mr. & Mrs. Know-it-all will proudly announce that everyone has worked together and showed tremendous skill and knowledge by presenting this Certificate of Achievement to be displayed for all to see! CONGRATULATIONS! 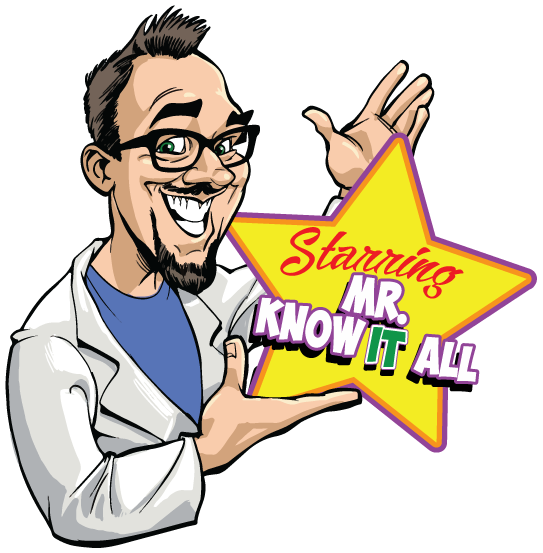 You are all now official ‘KNOW IT ALLS’ !!! This style show is focused on Customized Comedic Performance /Team Building Competitions. If you are looking for something different for your companyís Sales Events or Company Picnics/Parties, look no further! Mr. & Mrs. Know-it-all would love to shake up your next company function with their customized comedic performance. We will learn about and feature your own company, products, sales, services, people, competition, etc. and deliver it in a comedic style while everyone is roaring in their seats! 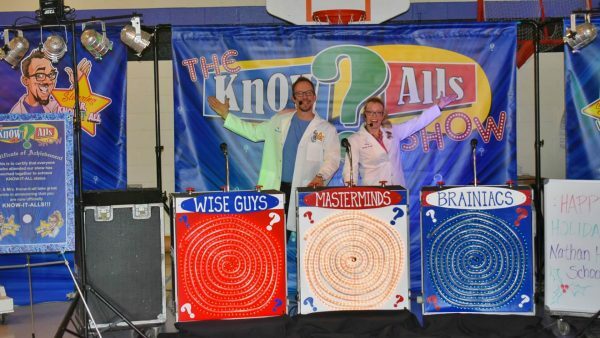 After the entertaining performance, the Know-it-alls will invite some volunteers up on stage to enjoy a little ‘friendly competition’ in a fun team building approach. In a quiz-type format, questions will be asked and the team that scores the most blocks, can boast about it at the office the next day! Scott enlisted in the U.S. Army after graduating High School. He served 3 years in Germany, and once home quickly realized that there was not much need for tank mechanics in the civilian world! Scott went on to get his AA degree in ‘Early Childhood Education’ with hopes of becoming a teacher. 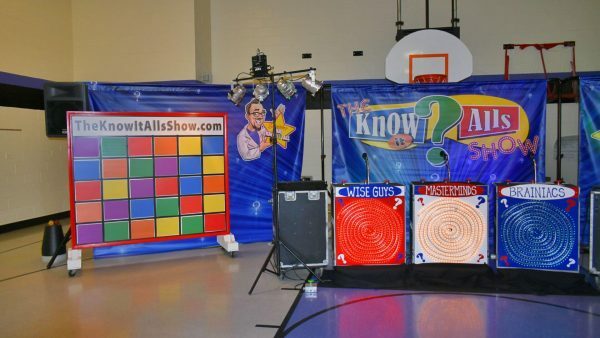 While attending college, he was recruited to be the host of an educational game show…that was over 25 years ago and he’s never looked back since! 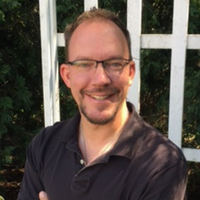 Over the last 25 years, Scott has listened to the people and learned what it takes to be successful with school assemblies, libraries, park districts, etc. He is highly-sought after in these markets because of his great personality and easy nature…and his sheer love of kids! Scott is also very involved with the Youth Group at his church that he’s attended since he was 12 yrs. old! This dynamic duo will delight any audience from kids to adults with their funny antics, quick wit and high energy! Patti has a B.S. Degree in Marketing and has put it to good use having worked in Marketing Research and Development, Advertising and Sales. She started her own entertainment company called ‘Jazzi Entertainment!’ and has been entertaining kids of all ages for over 25 years. Some of her many talents include face painting/airbrushing, balloon twisting, juggling, stilt walking, unicycling, magic, and clown shows. She began her entertainment career as a professional clown, ‘Jazzi’, and was a part of the Triton Trouper Circus from 2008-2012, receiving ‘Performer of the Year’ in 2009. She is an award-winning face painter, balloon artist, and clown. She also was inducted into the Midwest Clown Hall of Fame in 2009! (Wow! …now she is just bragging!) 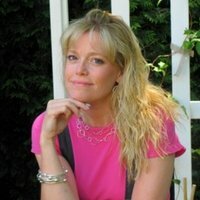 She has competed, judged, lectured and toured for many professional clown organizations and is currently the President of the Krazy Clown Klub in Buffalo Grove, IL. 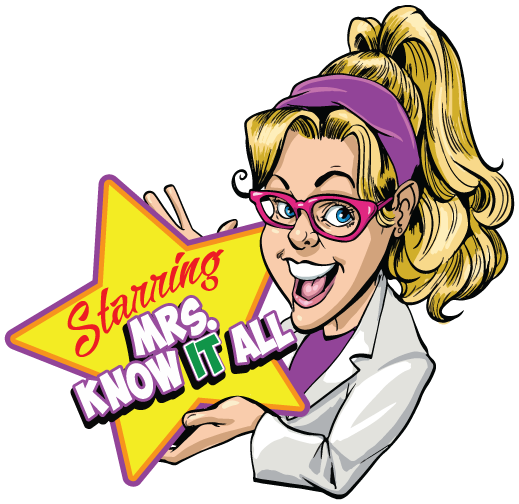 Most recently she has co-hosted an educational game show with Scott and now thrilled for her new role as ‘Mrs. 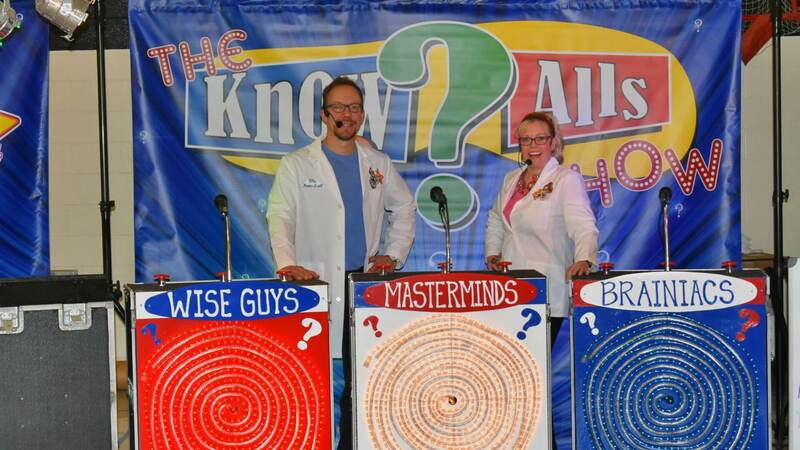 Know-it-all’! Together, Scott and Patti have over 50 years (that’s a half century you know!) 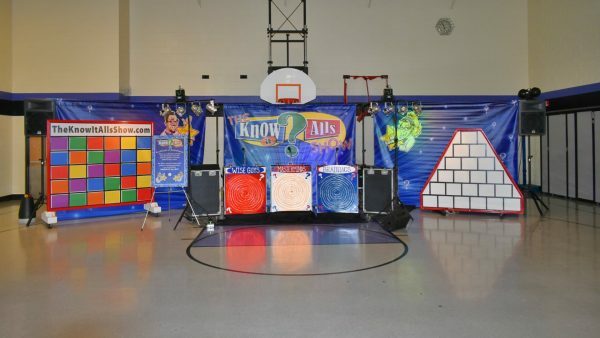 of combined entertainment experience with over 30 of those years performing for school assemblies, libraries, park districts/camps and corporate events! Once Mr. & Mrs. Know-it-all think they’ve done a great job “teaching” the new lessons to the kids, they will bring up volunteers based on their grade level. They will divide them into three different groups to demonstrate just how much they’ve learned in a quiz-type format. Blocks will be chosen from the ‘Wall of Commotion’ by several different volunteers. Each block will correspond to a specific category. Categories might include Math, Science, Social Studies, Language Arts, PBIS, Social skills, etc. This information may be something they already know, have learned in their classroom or have just learned during our show! But be aware! Volunteers must also be prepared for a challenge! Several blocks will require the groups or that individual to take part in a physical challenge in order to win that block! Questions will be given to the groups based on the category that was chosen. The first group to correctly respond will be awarded that block. The blocks will then get placed onto the ‘Pyramid of Knowledge’. Since this is a group effort, we do not focus on individual teams. All of the groups are working together as ONE team! Every block that is awarded will be used in the construction of the ‘Pyramid of Knowledge’! 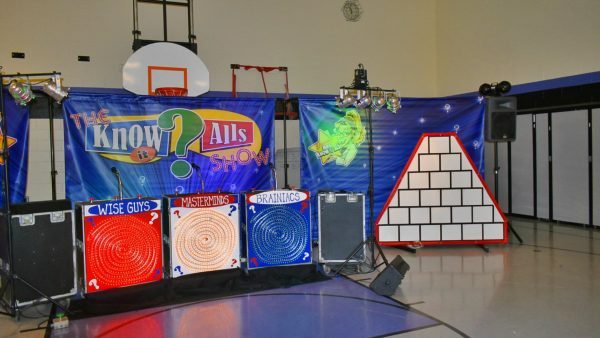 Once the last block is placed on the top of the pyramid, lights, bells and whistles will go off letting everyone know that they just won the Know-it-alls ‘CERTIFICATE OF ACHIEVEMENT’ for their entire school! Mr. & Mrs. Know-it-all will proudly announce that everyone has worked together and showed tremendous skill and knowledge by presenting this Certificate of Achievement to be displayed for all to see! CONGRATULATIONS! You are all now official “KNOW IT ALLS” !!! Once Mr. & Mrs. Know-it-all think they’ve done a great job “teaching” the new lessons to the kids, they will bring up volunteers based on their grade level. 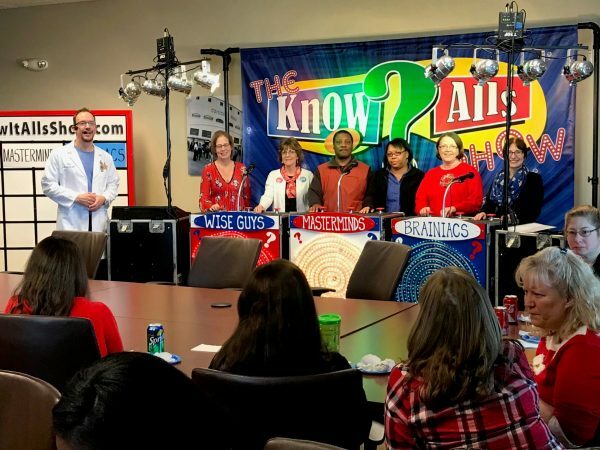 They will divide them into three teams to demonstrate just how much they’ve learned in a quiz-type format. Several competitions will take place during this 45-minute show. Blocks will be chosen from the ‘Pyramid of Knowledge’ by several different volunteers. Each block will correspond to a specific category. Categories might include Math, Science, Social Studies, Language Arts, PBIS, Social skills, etc. This information may be something they already know, have learned in their classroom or have just learned during our show! But be aware! Volunteers must also be prepared for a challenge! Several blocks will require the teams or that individual to take part in a physical challenge in order to win that block! Questions will be given to the groups based on the category that was chosen. The first group to correctly respond will be awarded that block. The blocks will then get placed onto the ‘Wall of Commotion’! The team with the most amount of blocks on the wall, wins! 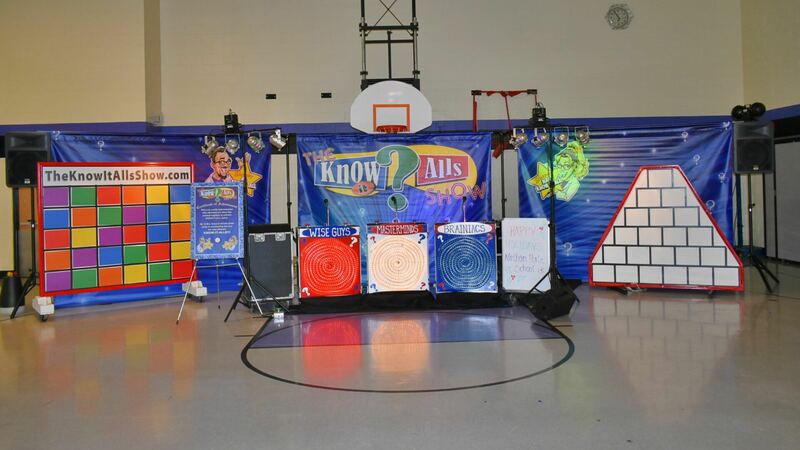 Lights, bells and whistles will go off letting everyone know that they just won the Know-it-alls ‘CERTIFICATE OF ACHIEVEMENT’ for their entire school or camp! Mr. & Mrs. Know-it-all will proudly announce that everyone has worked together and showed tremendous skill and knowledge by presenting this Certificate of Achievement to be displayed for all to see! CONGRATULATIONS! You are all now officially “KNOW IT ALLS” !!! If you are looking for something different for your company’s Sales Events or Company Picnics/Parties, look no further! Mr. & Mrs. Know-it-all would love to shake up your next company function with their customized comedic performance. After the entertaining performance, the Know-it-alls will invite some volunteers up on stage to enjoy a little “friendly competition” in a fun team building approach. In a quiz-type format, questions will be asked and the team that scores the most blocks, can boast about it at the office the next day! 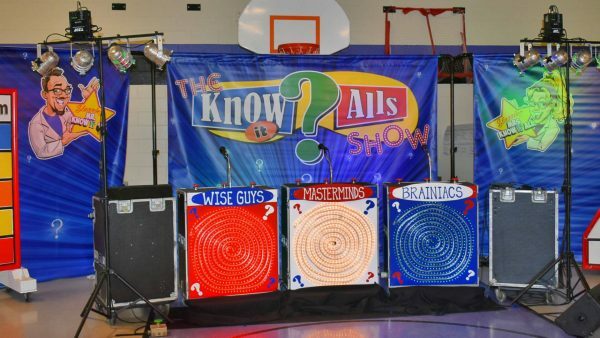 The Educational Variety Show that will turn you into a KNOW-IT-ALL! Fill Out Contact Form Below!